The tears just do not stop. “It is 13 days and my child is nowhere to be seen”, Najeeb’s mother keeps repeating with a helplessness that is overpowering. It takes a while to make her talk. Her back is stiff with hostility, her eyes dry when one is first introduced to her. Her face set, she has no interest in talking to yet another journalist, and makes it clear at the onset through body language that she sees the effort as a major imposition. But she cannot hide the pain, and the suffering for long. Fatima Nafiz, the mother of young Jawaharlal Nehru University student Najeeb who went missing after being assaulted by students of the Akhil Bharatiya Vidyarthi Parishad 13 days ago, does not even acknowledge your presence depsite being introduced by a relative. Her eyes are fixed on a relative carrying a mobile phone. And she jumps up, rigid, looking at him as he answers the phone. He gestures to her, and she slumps down into her seat, the dry eyes welling up with tears. For her every phone call is a hope that her missing son has been found. She says later that she starts every morning in anticipation of that phone call. “But no one has called, my child has been taken away,” she sobs. Fatima bibi has no interest in talking to yet another journalist. As one tries to open the conversation she says, “I am very tired of repeating myself over and over again. You come and speak to me, you ask me questions, and then you go and write all lies. You do not even bother to write what I have said.” Her younger son nods assent. He too is almost hostile, fed up with the Delhi media that has little interest now in the truth of Najeeb’s disappearance. After a while she relents, and tries hard to control the tears that stream down her cheeks, as she recounts the days since she last heard from her son. In fact she is relatively calmer speaking of the past. Of the times when they were all together. Najeeb Ahmad had sat for his medical entrance examinations but did not qualify and so applied for universities in Delhi including Jawaharlal Nehru University and Jamia Millia Islamia. He had signed up for Jamia, but when he got admission in JNU he took that instead. Were you very happy when your boy got admission after all the hard work? Fatima Nafiz shakes her head. “No I was not, it did not matter to me really, but he kept insisting that it is a big opportunity, ‘you know Ammi, JNU is the Oxford of India’, and all that so I agreed.” She came to Delhi with him, they took a room on rent in Okhla until Najeeb got place in the JNU dormitory after a month. “I went with him, saw everything was fine,” and then she returned home to Badaun. He moved into the hostel just a day before the assault, and two days before his disappearance. He was sharing the room with another boy. She was sleeping when the phone rang on the night of October 14. It was after 1am in the morning. It was Najeeb, distraught. “He said something bad had happened, that he was in Safdarjang hospital, and that I should come to Delhi immediately,” Fatima bibi sobbed. She scrambled out of bed, and with her younger son boarded a bus within two hours of receiving the phone call. They reached Delhi and she called her son again at 11 am to tell him that they had arrived, and she would be with him soon. He was back at the hostel by then. After that life has become a whirl. She reached the hostel to find Najeeb missing. “We searched everywhere, we found his slippers and his mobile phone in the room,” she cries. She was hoping like his friends that he had just stepped out, “and it is 13 days now, they have taken away my boy.” Her younger son, is sitting beside her his face registering the tension, as he tries to console his mother. To assure her that Najeeb will be back, but in a voice that does not seem to believe what he is saying. Friends and family piece together that night. Najeeb was sleeping in his room when three ABVP boys went in, supposedly campaigning. No one knows what happened inside the room, with one of the ABVP chaps insisting later that he was hit by Najeeb, a fact of which there is no independent proof. Najeeb who knows the story is missing. But the ABVP students dialled for reinforcements, he was attacked and badly beaten in front of eyewitnesses. The numbers vary but the assailants are placed at around 20 —some students insist there were at least three outsiders—who badly beat Najeeb in full view of the warden who had reached the spot by then. Other students tried to save him, but they were fewer in numbers and could not effectively challenge the assailants. 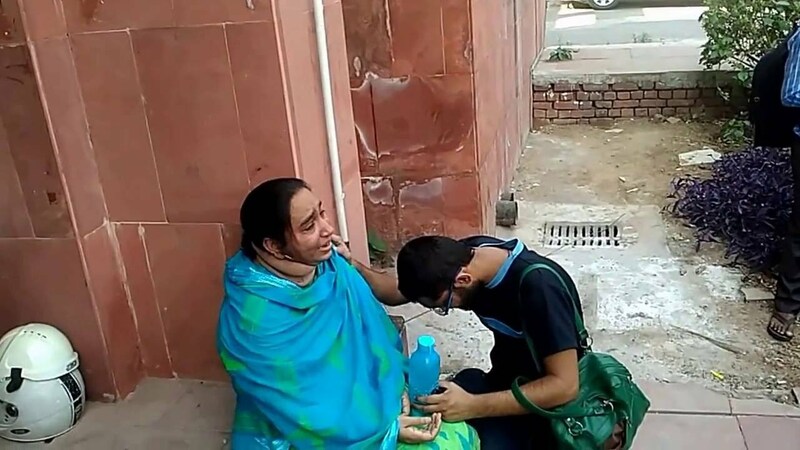 Najeeb was finally taken to the hospital by the students, and called his mother from there, asking her to come to him as he needed her. The urgency in his feeble voice still haunts her, and was sufficient to make her ask no questions, but to pack a small bag and rush to the bus station to be with her son. The police has offered a reward for his whereabouts and has pasted posters around the area. But Najeeb is still ‘wanted’ as an accused as the ABVP has lodged a case against him. The students share the worry of his family. The JNU Administration clearly does not, with sections of the faculty accusing the Vice Chancellor of abdicating responsibility and taking sides.